As I watch the 69th Annual Golden Globes, I decided to tingle my taste buds and have some sorbet from Ciao Bella. 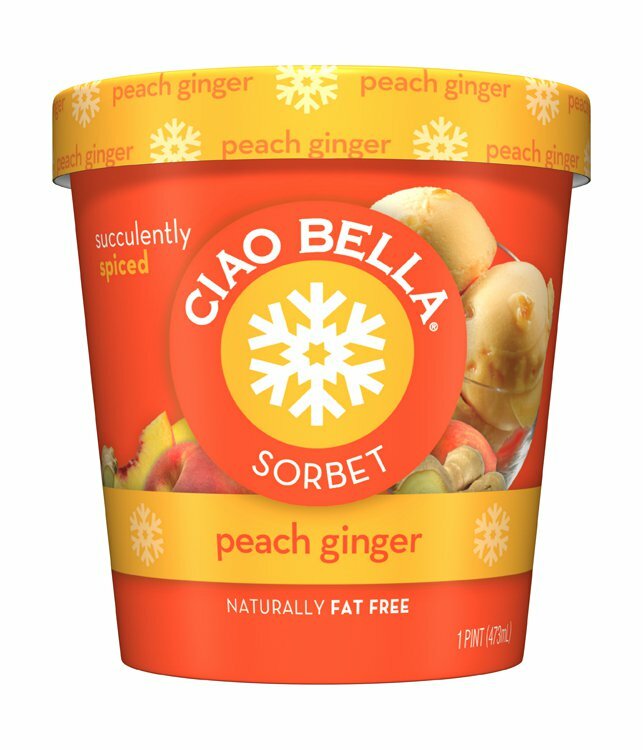 I’ve told you all about how much I enjoy Ciao Bella’s line of sorbet and my newest favorite is the Peach Ginger. If you are looking for an exciting new taste, this is the dessert for you! Ciao Bella said it best when describing Peach Ginger sorbet. Succulently spiced and nectar sweet, laced with spicy candied ginger – this mouthwatering sensation is sure to awaken your taste buds. It really is fabulous and delicious and tickles my taste buds. The candied ginger plays so well with the peach sorbet it really is a delightful combination. Plus its gluten free and dairy free!! Peach Ginger sorbet. Try it. Open your senses and your pallet and ENJOY! Another bubbly delight brought to you by Ciao Bella Sorbet. Seriously my favorite sorbet so far! (Until I go to Italy and then gain tons of weight from eating Italian sorbet…ahhh that’s the dream) anyway I’m rambling…here’s the recipe! 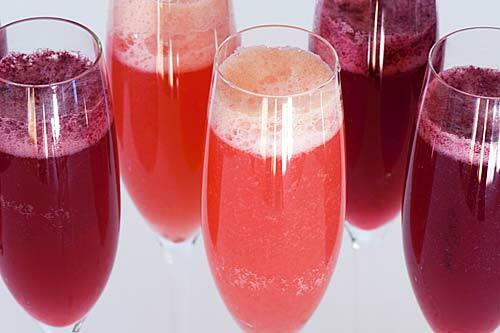 Freeze some wide mouth champagne or red wine glasses. Cocktail time. How about a Wild Blueberry Lemon Drop? It uses not one but two delicious tart and sweet sorbets from Ciao Bella! In a shaker with ice, add all your ingredients except for the Lemon Zest Sorbet and shake,shake, shake! Pour into chilled glass with a sugared rim. Finish by adding a scoop of Ciao Bella lemon Zest Sorbet. Looking for a sweet and tangy treat that’s also gluten free? Stop looking. I have found it! Ciao Bella Sorbet. I first had Ciao Bella in the Grand Central Station dining concourse and found out that you can buy them in your favorite supermarket. I have been hooked every since. 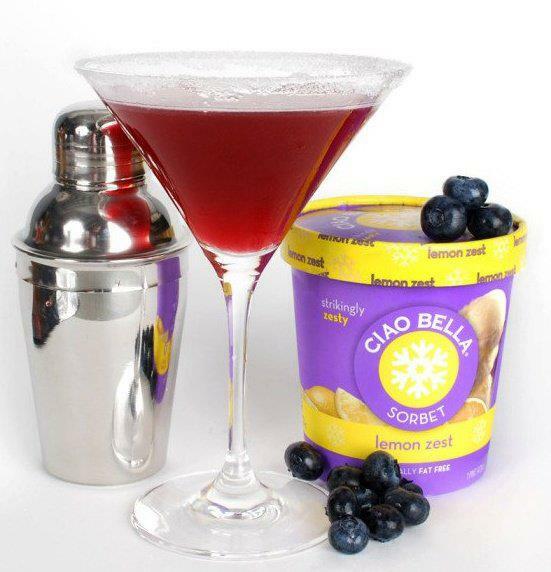 Ciao Bella Sorbets are delicious and come in a variety of rich, sweet flavors. Coconut has a sweet and milky flavor while the passion fruit (which I am enjoying right now) is just the right amount of tangy and sweet. The same can be said about the mango sorbet (one of my personal favorites). 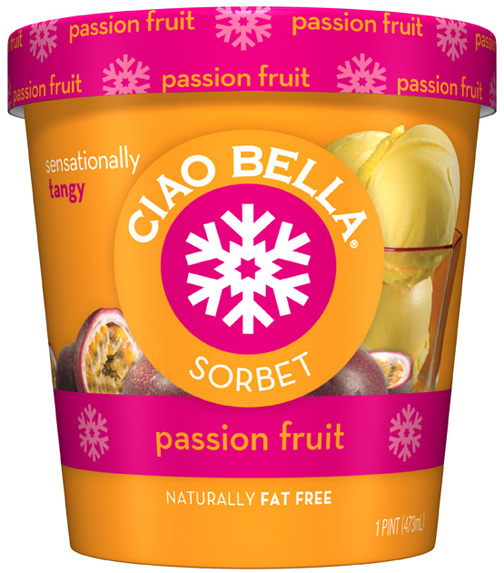 You can find Ciao Bella Sorbets (and Gelato) in the freezer section. I cannot wait to try the flavors I haven’t tried yet. So on your next trip to the grocery store, look for Ciao Bella and try it for yourself! Passion Fruit Sorbet - tangy, sweet and gluten-free!